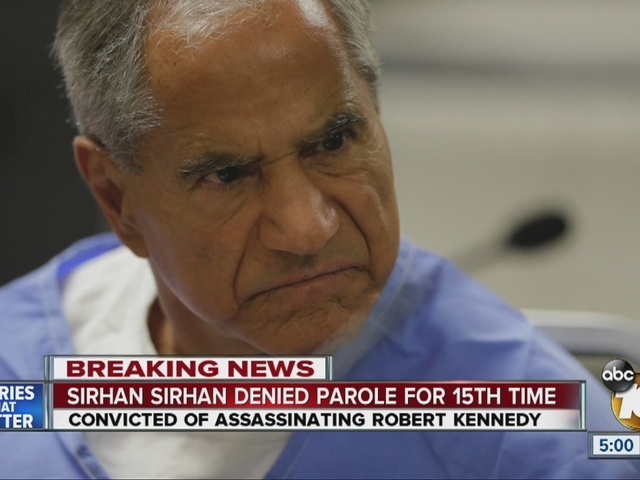 For the 15th time, officials denied parole for Sirhan Sirhan, the assassin of Sen. Robert F. Kennedy, after hearing Wednesday from another person who was shot that night and called for Sirhan's release. 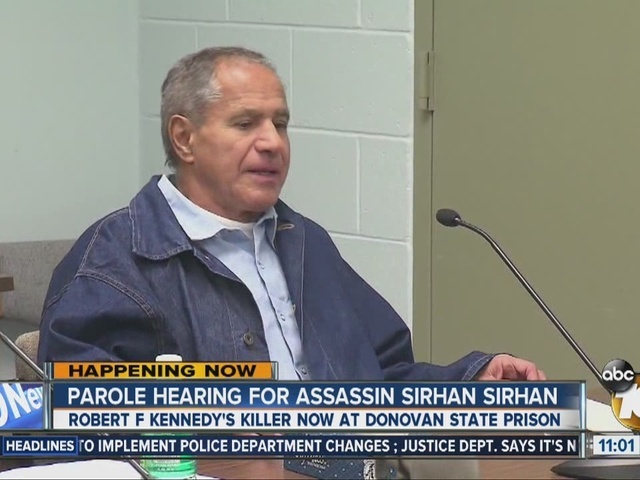 The decision came after Sirhan answered questions from a California parole panel during a hearing that lasted more than three hours in a small, windowless conference room. Commissioners concluded Sirhan did not show adequate remorse or understand the enormity of his crime. 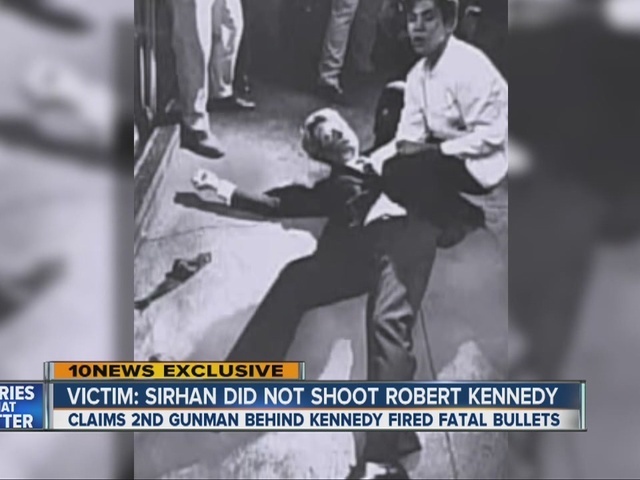 During the hearing, the 71-year-old Sirhan stuck to his previous account that he did not remember the shooting in 1968 at the Ambassador Hotel in Los Angeles after Kennedy won the Democratic presidential primary in California. He said he recalled being in the hotel then going to his car and returning after realizing he had too much to drink. He said he became interested in a female and they drank coffee in a hotel pantry. "It's all vague now," Sirhan told the parole panel. "I'm sure you all have it in your records, I can't deny it or confirm it, I just wish this whole thing had never taken place." Sirhan, a native of Jerusalem, listened intently during most of the hearing, turning testy when commissioners pressed him on his memory. He said he felt remorse for any crime victim but added that he couldn't take responsibility for the shooting. Paul Schrade, 91, told the panel that he believes Sirhan shot him at the hotel but an unidentified second shooter killed Kennedy. Schrade was alongside the candidate when five people were injured in the June 5 shooting. Schrade was shot in the head. Schrade's voice broke with emotion at times during his hour of testimony that recounted his efforts to unravel questions about the shooting. "I forgive you for shooting me," Schrade told Sirhan. "I should have been here long ago and that's why I feel guilty for not being here to help you and to help me." The two men faced each other for the first time since Schrade testified at Sirhan's 1969 trial. Schrade was western regional director of the United Auto Workers Union and labor chair of Kennedy's campaign at the time of the shooting. On Wednesday, Sirhan nodded politely each time Schrade sought his forgiveness. Retired Deputy District Attorney David Dahle argued at the hearing for the district attorney's office. "The prisoner has still not come to grips with what he has done," Dahle told the panel. Sirhan is serving a life sentence that was commuted from death when the California Supreme Court briefly outlawed capital punishment in 1972. Sirhan told the panel Wednesday that if released, he hoped he would be deported to Jordan or live with his brother in Pasadena, California. As Sirhan left the hearing, Schrade shouted, "Sirhan, I'm so sorry this is happening to you. It's my fault." Sirhan tried to shake his hand but a guard prevented it.